After a heated debate Tottenham has been allowed to sell out all of Wembley during their 2017/18 Premier League campaign. With PL games alone this means over 1 million tickets more than at White Hart Lane. It lasted long 3.5 hours, but brought victory to Tottenham. Last night’s debate of Brent Council’s planning committee saw 5 members vote in favour and only 1 against the notion to allow 22 additional full-capacity games at Wembley. The decision comes as Tottenham are about to play a whole season at Wembley. As you may recall, in January Wembley and Tottenham teamed up in their effort to increase the maximum number of games with 90,000 seats available. 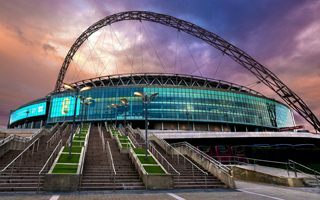 Previously, under the stadium’s planning permission, Wembley could offer Tottenham only 5 games with all seats available. For all additional fixtures the club was to have capacity capped at 51,000 seats. Tottenham and Wembley were first hoping to increase the number of full-capacity games from 5 to 37, eventually lowering the expectation to 27 (5+22). This means Spurs are free to sell out the entire stadium (85,000+ realistically) for all 19 Premier League home games. Compared to current capacity of White Hart Lane (limited to 32,000 after one corner was demolished), this effectively increases the number of available Premier League tickets from 600,000 to 1.6 million! 27 home games with full capacity is still less than Tottenham will play at Wembley in 2017/18. Combined with Champions/Europa League and FA Cup that list will likely be well above 30. What happens when they run out of full-capacity games? Chris Bryant, head of operations at Wembley Stadium, arguing in favour of the proposal, suggested that any matches outside the quota of 27 could also be played at full-capacity, depending on scheduling. "Spurs will be the priority," Bryant told the committee. Residents and some councillors expressed concerns ranging from the impact of the proposal on local businesses to travel disruption, policing and anti-social behaviour on match-days. During the 2-month application and consultation period there were many signals that local community might not be entirely happy with such increase in number of events. After all, the stadium has a limit on full-capacity events in order to protect locals from excessive nuisance of England’s largest stadium operating in Brent. During the consultations a total of 164 letters were sent with only 8 of them being in favour of the capacity increase! During the 2016/17 season Tottenham had a preview of what will happen, playing their European games at Wembley and seeing four games with over 80,000 people in attendance. If they manage to reach such levels in the upcoming season of Premier League, Tottenham could become Europe’s largest club in terms of attendance. The temporary relocation to Wembley is caused by Tottenham’s ongoing construction of a brand new 61,000-seat stadium. They managed to remain at White Hart Lane in 2016/17, though with decreased capacity and temporary access routes. This year WHL will be demolished to make way for parts of the new stadium. Tottenham are expected to return to their rebuilt home in 2018.